St. Croix*Big 5BR/3.5BA*Walk to the Beach*Dog Friendly*Big 50" LCD! *Sleeps 14! Fabulous Caribbean Style cottage in Emerald Shores! St. Croix is a 5 bedroom, 3.5 bath home in the gated neighborhood of Emerald Shores off Scenic Gulf Drive in Destin. This home is a short 5 minute walk to the community's private beach access via a Pavilion with lounge chairs, picnic tables, and restrooms. Recent upgrades include a big 50' LCD TV with High Def channels in the living room and a big 32' LCD Sony Bravia in the Master Bedroom! Slate tile floors added to the front and side porches. Big propane BBQ grill on side porch for barbecuing at home! Owners have thought about every comfort and made this home extra nice! St. Croix sleeps 10 adults and 4 children! Our bunkbeds are designed for children! There is a king bed in the master bedroom on the main level, a king and 2 sets of bunks on the 2nd level, and a king and 2 twins on the 3rd level. Catch a glimpse of the Gulf from the 3rd floor balcony! There is also a sleeper sofa in the living room. Decorated in beach themes and colors, this home is a fantastic vacation home! Two covered 1st floor porches and 2 covered balconies! You'll love the space and amenities with this home. Emerald Shores has 2 pools, a tennis court, basketball goal, shuffle board and a great location to Destin attractions! Come once and you'll come again and again! No smoking is permitted. ***Small, clean, and well behaved, friendly dogs are permitted. Add $100 per dog up to 2. *** Can park 4 cars or 3 SUVs! We are from Pennsylvania but have been coming to Destin for years! We love it so well that we bought several pieces of Paradise! Emerald Shores is the best Vacation Home neighborhood along Scenic 98! 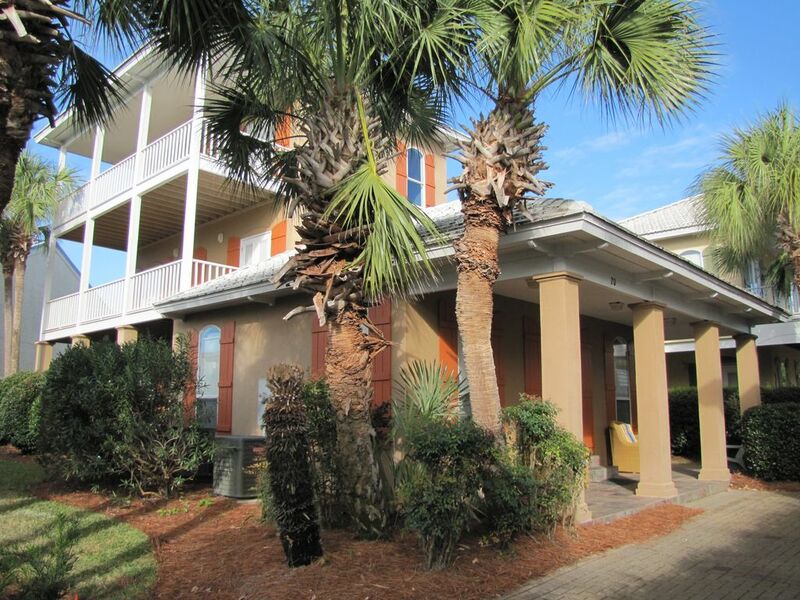 Emerald Shores is gated at both ends with easy access to the beach and HWY 98! The most unique feature is the private beach cabana with lounge chairs, picnic tables, and restrooms directly on the beach! No other neighborhood has one! toilet, Half Bath 1st floor in hall. toilet, combination tub/shower, Private to Master Bedroom 1st floor. 3.5 baths. 1 on each floor plus half bath on 1st floor. Bring your beach and pool towels! Bath towels are provided. 50' Flatscreen in the Living Room! (6) Big 50' TV with High Definition channels in the living room. 32' LCD Sony Bravia in the Master Bedroom! Plus TVs in all bedrooms! 2 balconies plus 2 covered porches! Big home with nice upgrades very close to the beach! Make wonderful memories here! You'll love it! Lots of things to do in Destin! Close to everything! You'll enjoy the shopping, restaurants, and night life! The kids will love the beach, pools, theme parks, and Big Kahunas! You'll all love the gated neighborhood with 2 pools, tennis court, basketball goal, and private beach cabana right on the beach with lounge chairs, picnic tables, restrooms, and a short order cafe/bar only a 5 minute walk from our home! ***ADD Cleaning, Booking & Processing Fees + 11.5% TAX on all. Fully Refundable if canceled more than 60 days in advance minus $150 fee. before arrival. Optional Trip Cancellation Insurance offered at 6.5% of total.